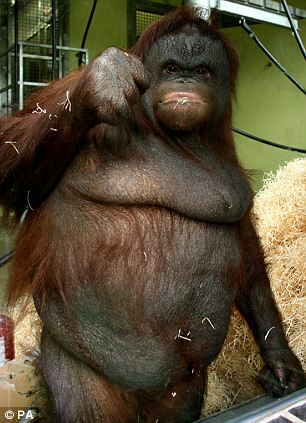 Weighing in at a hefty 15 and a half stone, tubby Oshine gives a whole new meaning to the phrase Great Ape. 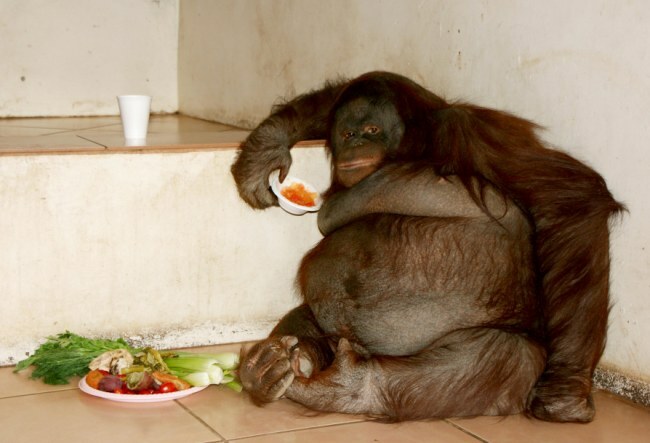 After a lifetime being indulged with jellies, burgers, chips and marshmallows, the 3.5ft tall ape weighs twice as much as a healthy orangutan – and as much as portly six foot tall man. 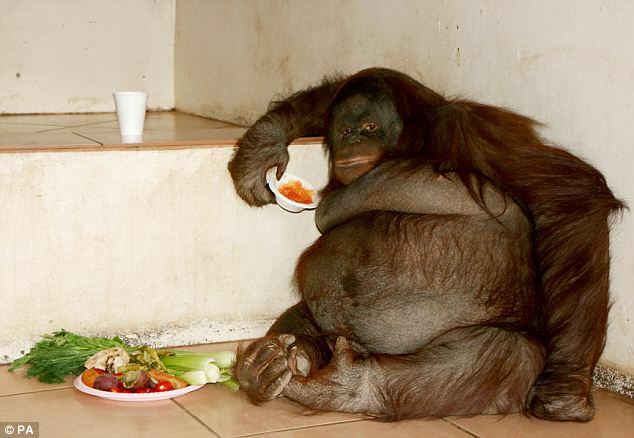 Now, Britain’s fattest primate is changing her ways. After being rescued from the care of a couple of well-meaning but misguided, owners, Oshine is being put on a strict diet of fruit, yoghurt, lean meat and vegetables. Keepers at Monkey World in Dorset hope the 13-year-old will be back to normal size within a few months and ready to try for her first baby. 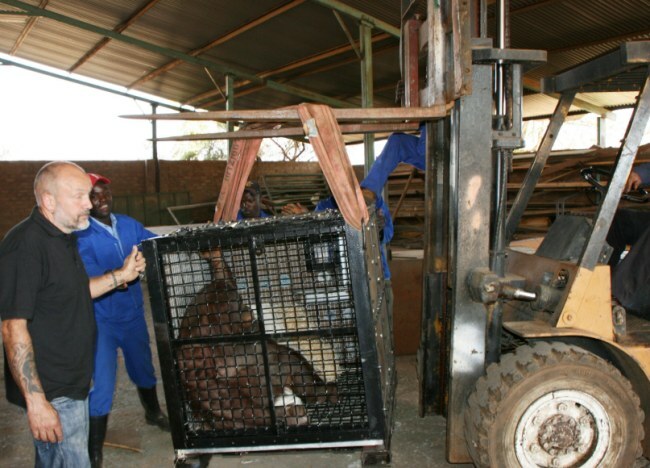 Oshine arrived at the rescue centre from South Africa where she was kept as a pet since she was a baby. Her sedentary and unnatural lifestyle meant her weight rocketed. A wild, healthy orangutan would normally weigh between five and 12. stone. The owners contacted Monkey World two years ago when they realised they could not offer Oshine a healthy lifestyle as a pet. She flew the ten and a half hours to Heathrow on August 31 in a specially designed cage and was immediately placed on a diet. ‘We have been working to give Oshine a more natural life with others of her own kind for more than a year,’ said Dr Cronin. ‘The long-haul journey for such a delicate endangered species such as an orangutan is fraught with difficulties and danger. Although a fully-grown adult, Oshine is now living in the orangutan creche at Monkey World. 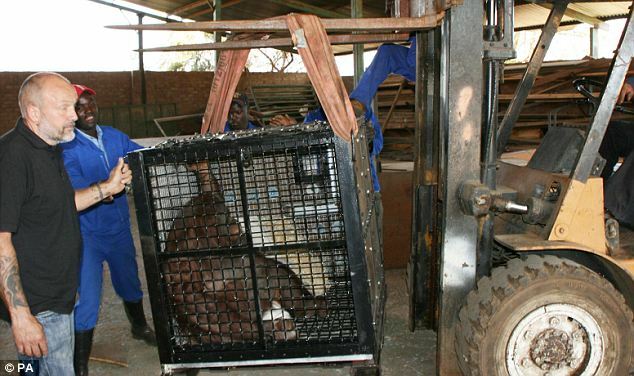 She will live alongside four captive born babies born in European zoos who have been abandoned by their mothers. The Monkey World team say living alongside babies will teach Oshine ‘how to be an orangutan’. Once she loses weight, gets fitter, and understands more about ape behaviour, she will ‘graduate’ into one of two breeding groups where it is hoped that she can start her own family. ‘Now that she is at the park, we have her on a healthy diet of vegetables and fruits and she is getting a lot more exercise climbing through the specially designed, two storey orangutan creche,’ said Dr Cronin. Monkey World is home to Europe’s only orangutan creche and has 14 orangutans. It not only breeds the apes but offers a home to any babies born in European zoos that are orphaned. In the creche orphaned babies are cared for by a team of dedicated primate care staff and an adult female orangutan, A-mei. A-mei is surrogate mother to the young orphaned orangutans, Dinda, aged four, Hsiao-Ning, seven, and Joly and Lingga, both five. In the wild, orangutan are threatened by the destruction of forests for farmland for food and palm oil – used in processed foods in West.